Not long ago, Matthew Sleeth was living the American Dream. He had a great job as chief of the medical staff at a New England hospital and a successful life—until he saw an increasing number of patients suffering from cancer, asthma, and other chronic illnesses. He began to suspect that the earth and its inhabitants were in deep trouble. At the time, Sleeth was an atheist who thought that science and logic held the answers to life’s problems. After “stealing” a Gideon’s Bible from a patient waiting room, Sleeth discovered how the scriptural lessons of personal responsibility, simplicity, and stewardship could be applied to modern life. The Sleeths have since become believers, selling their big home and giving away half of what they once owned. Sleeth shares the joys of adopting this healthier, less materialistic lifestyle with his family, which led to stronger relationships and richer spiritual lives. 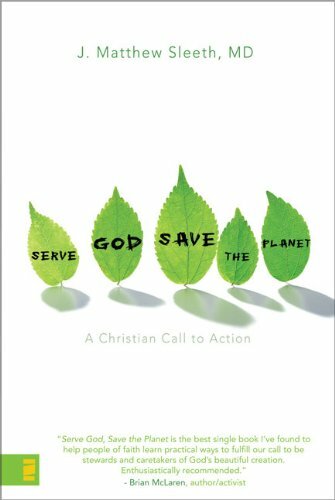 With the storytelling ease of James Herriot and the logical clarity of C. S. Lewis, he lays out the biblical case for creation care and provides practical advice for making responsible stewardship changes in your daily life.